Don't undermine the Power of Pause! This may be the only thing you need to practice right now. Hemant Sharma - Mojo of Small Things, The Small Things that we do are the big things. Unleash the Power of Pause! ‘Hold it there for a few more seconds’ said the instructor, It was my first Yoga Class and I was doing a plank. I felt the tension in my core and came a realization that I had been doing it incorrectly all my life. Suddenly a sequence of events started playing in front of my eyes, in that brief moment of PAUSE and It just came to me like a flash that I was not taking a PAUSE where I should. I was young and I was groomed to do things fast, one after the another, yet I was missing something. I was not having ‘real’ friends (the 2 am, I want to talk friends), I was not having ‘real’ fun (not the one that is hormone driven), I was more volatile and I was not growing. That day I decided to take the Yoga Class instruction further beyond the Yoga Studio – ‘Hold it there for a few more seconds’, and things started changing. 1) Pause gives you the time you need to stay on the right path. Eat one more helping of dessert! He can’t be rude, just give him back! Taking time to just stop and take two deep breaths can actually turn the otherwise potentially regretful decision into something that is going to be good for you. A friend of mine told me a long ago and it stuck – When you consume more food than you need, you kill yourself slowly. When you consciously make decisions that are wrong for you, you reinforce a mindset of taking yourself too lightly. Take a deep breath and ask – ‘Would I suggest this to someone I love?’, if the answer is NO – Don’t do it yourself too. No one loves a colleague who would be brash/rude one moment and regretful the next. (Hey! it is not an oxymoron – Energy comes from Purpose and Stability comes from Mindset). Take two deep breaths before you make a decision, Ask for time and trust me people won’t mind if you emerge fair, rational yet considerate. Hitting ‘SEND’ button too soon, Saying ‘YES’ when you shouldn’t, and getting cornered into a decision that you won’t have made on your own- can lead to more than you can handle afterwards. 4) A PAUSE makes your life better by helping you to stay in the moment. In a nutshell- a Pause helps you live a life of no regret, passion and gets you out of repeating what you shouldn’t have done at all. PAUSE before you proceed – two deep breaths are all you need for a good life. Note: It is tough that now how we have been groomed, but it is worth it. 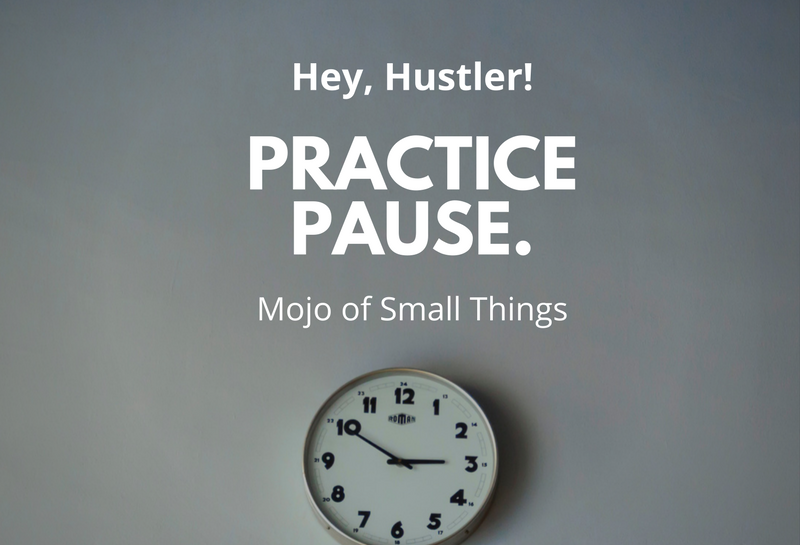 I am Founder of 'Mojo of Small Things', wherein we create content, merchandise and workshops to help unravel the magic of small things. The magic to help you make your life 'Good- Better and eventually Great again'. Mojo of Small Things works around the 'Golden triad of LIFE-LOVE-WORK'. Mojo Wisdom: Wisdom (age old and modern day) in less words for you to access anytime. Mojo of Story Telling: Unleashing the Power of Story Telling for a better life. See you on the other side: The Better part of Life!